This class bridges the interfaces of OpenMesh properties and OpenSG GeoProperties. The PropertyKernelT uses these adaptors to add all necessary property functions to the kernel, while the AttribKernelT extends the kernel with the standard properites. Finally the ArrayKernelT completes the kernel build with a specialized version of the garbage collections since the GeoIndices require special handling. 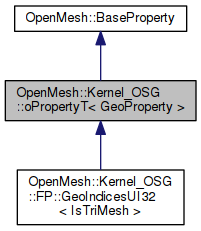 Data will be shared with a geometry core when linking a mesh with a OpenSG geometry node using Kernel_OSG::bind.